It happened on an otherwise normal Thursday at around 5:30 pm, just as we were about to sit down to dinner and midway through a phone conversation the kind of which I’d had one too many of in the past few weeks. What had been on a slow simmer began to boil. My last nerve was shot. I was suffering from road rage, sidewalk rage, apartment-building-hallway rage – not to mention grocery aisle rage – and for the next few hours I fumed and moped around like Victoria Beckham having to wear her “fat jeans.” Ike crawled under his side table “cave” and Kel nodded solemnly at my every curse and intoned, “Yes, dear. Yes, dear,” a hopeful mantra designed to stave off the meltdown he could see coming. The evening walk didn’t help. A cup of hot chocolate made barely a dent. Then a few hours after the phone call it hit me: I was seriously stressed out. I needed a change of scenery and fast. Luckily, a remedy was already in the works. It was time to go where the air is thin and clean, the sky a piercing blue and where the wind holds an icy touch of the winter to come: the mountains. By 10 am the next morning we were headed up to Bobby Redford’s little retreat in the Wasatch, Sundance. The winding road up to the resort is a therapy of its own. One must concentrate on where the car is; there’s no space for anger or stress. Sundance is tucked into the hills and amongst tall trees and despite the fact that there are restaurants, a screening room, art studios, cabins and homes (not to mention ski lifts and runs), it feels very secluded and small and homey. Fall, in my opinion, is the perfect time to go. Interspersed among the yellow-leaved aspens that blanket the mountainsides are bright dots of red, orange and deep green. We wandered around the resort and then treated ourselves to “wet” (no foam) soy lattes and settled onto a bench outside to watch the Beautiful People go by. Because the tram up to the top of the mountain (and to hiking trails) doesn’t allow dogs, we finished up our lattes and decided to do our hiking elsewhere. The road beyond Sundance is switchbacked and extremely narrow. It felt as if our car was skimming the edge of the road as vehicles coming the other direction drove past us. I missed a lot of the scenery while hugging the road, but Kel reports that it was spectacular. When we reached the Timpanogos trail head and the hiking route up to Stewart Falls we stopped for a picnic lunch at the old amphitheater hidden among the pines, then we pulled on our day packs and headed up. Unfortunately, just as the photo-taking was becoming interesting, my camera battery fizzled out and I had to turn to my trusty iPhone for the remainder of the hike. The total 4-mile hike up and back to Stewart Falls took us about two hours. On the way home we decided to take a short detour to visit The Point of the Mountains. Kel had been reading a lot about paragliding lately and we learned that one of the premier spots in the country for the sport is right here in Utah. When we arrived, it wasn’t looking good. There were only a couple of cars in the parking lot and two guys gazing forlornly out from the high plateau down to the valley spread out below. Two gliders lay still strapped to the tops of the cars, wrapped up tight in their canvas burritos. There wasn’t a breath of wind. While Kel went off to interrogate Man Number One, Man Number Two suddenly appeared beside me and Ike. We started talking about dogs and soon enough Dave, a hang-glider and instructor of 41 years, offered to take me up on his glider once the wind was right. My mother didn’t raise a fool and I simply laughed it off and let Ike pull me away from the salesman pressure for a bit. Before long, Kel and Dave and I and Man Number One were talking wind and gliders and geography and how silly and foolish paragliders were as compared to hang-gliders. Man Number One decided to set up his glider just in case the wind changed and Dave got to talking about thermals and how thermals were all about contrasts: dirt and pavement; high ground and low; heat and cool; light and dark. I got it, but my mind wandered anyway. The view out there was just too big, too beautiful. Endless sky above, a long, flat valley below with the mighty artery of I-15 splitting it in two, teeming with rush hour cars headed for home, north and south; to the east the Wasatch buckled and climbed; to the west lay the hazy shimmer of the Great Salt Lake. As Dave’s voice morphed into the pleasant hum of white noise, my eyes drifted upwards and I saw a large hawk circling high above the field on which we stood. He was gliding effortlessly, wheeling in the air without moving a single feather. No doubt it looked down upon us poor humans with pity and mirth. Our puny wingspans, our heavy burden called gravity. There was no doubt in my mind that his presence above the well-known hang-gliding and paragliding site was no accident. He was shoving his winged freedom in our faces. At some point, Dave set up his glider and offered to let me slip into the upside down hammock-suit – “just to get a feel” for things. Once I felt how comfortable it was he was pretty sure I’d be asking to take the glider for a spin with him. (For the low, low price of $100.) I hung out in the hammock-suit for a while and then all at once a strong breeze rose over the plateau. I looked across the field and saw paragliders everywhere – their colorful parachutes billowing and collapsing, rising and falling. Some fliers were already strapped into their funny “seats” that resemble turtle shells, some dragging their chutes to the edge of the field where they would step off and hope to be lifted into the air. Already gliders were circling above us, seeking the hawk’s thermal. They made their slow way along the edge of the plateau and up and up, heading east and then west again, then east. Some of them were high above, looking as if they were going to touch their toes along the mountain’s edge. We feared the gliders – so close together – would collide and fall, but somehow they all missed each other. I extricated myself from the hammock and soon enough we saw Dave climb into his suit and lope off carrying his hang-glider. He walked slowly and with effort along the thin gravel runway at the end of which is a sign imbedded into the ground that admonishes pilots to “Hook In.” Dave stood at the edge for a minute and then he was off the ground, soaring, moving with a speed and purpose unmatched by the paragliders. He looked like a giant bird. For a tiny second I wished I had hooked in next to him, but the solid earth felt pretty good under my feet. He seemed to be heading straight for the sun. I watched him for a while and then looked back above the field and then above the mountains, but the hawk was gone. There were only humans flying. I can’t believe I forgot to ask you about Sundance. Blame it on the food poisoning! Great photos, and as you know, I run near that Paragliding park all the time, so fun to see all of them in the sky above. Awesome, and yes, soy lattes count! Don’t worry, I was planning on boring you with the details during our next date ;-)! Hi Laurie – wow, what a great birthday gift! Makes me wish I’d gone for a little ride myself. Maybe next time I’ll have the courage. Apparently I DO need to “bag” Timpanogos – didn’t know it was kinda the thing to do! I told my husband the other day that I would hang glide if given the chance. I think I’d love it! I think I would, too, Holly. It’s taking that leap off the edge of the mountain that gets me! Gorgeous photos! I think I need a dose of trees and fresh air myself. Thanks, CCU! I think I’m due already for another day out :-)! Thanks, Kristy! It certainly did. Another day away planned for Friday! Absolutely glorious. Hope your spirit is restored. The perfect time of year to enjoy that beauty, I’m sure. I feel relaxed just looking at those photos! Thanks for sharing. 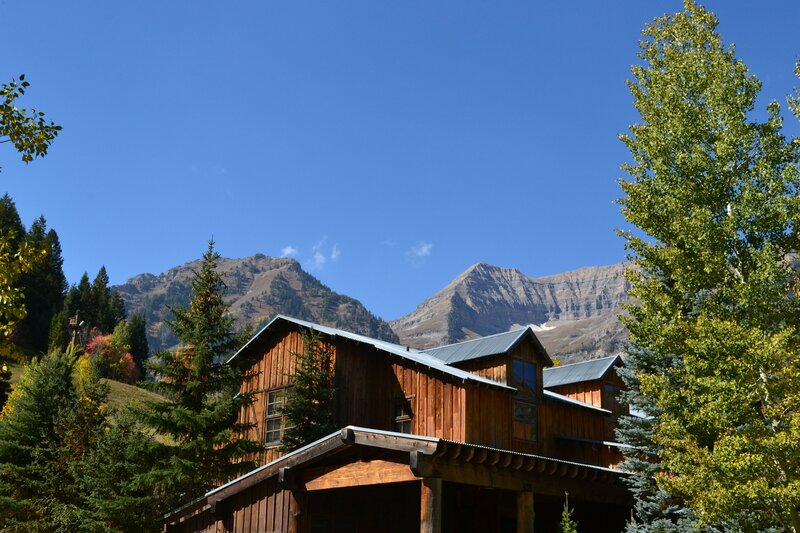 Fall in the mountains…doesn’t get much better than that. Thanks, Sarina. Haha! I know what you mean! This is gorgeous! I’ve been to Utah once before, but it was in the wintertime..beautiful in its own way, yet I would love to experience such fall seasons. Florida is slackin’! Thank you so much! Fall is wonderful – especially so in the mountains. It’s as if nature is giving you an extra special treat right before it socks you hard with tons of snow, bitter cold and fierce winds ;-)! I’m hoping to spend a little time in FL this winter, actually. Thanks, Lorna! The phone did admirably – though some photos were, well, awful. Thank goodness for digital! Don’t you love the name of the place? Robert Redford named it after his character in Butch Cassidy and the Sundance Kid – but the idea of sun dancing…nice. Oh, lattes. We are firm no-foam-latte people. Two reasons: one, the foam tends to burn ones tongue if they don’t wait long enough for things to cool down; and two, we want more latte rather than foamy stuff! So we ask for it “wet,” which is a term we just recently learned. Hanging about with barristas too much, I suppose! I think Kel has dreams of being a barista, too ;-).